On a recent trip to southern Germany, I did a little research into my great uncle, Albert Schinzinger. He had been an officer in the German army, when he fell in love with a ballet dancer. Marrying a dancer was not considered proper for a German officer so Albert had to resign his commission. 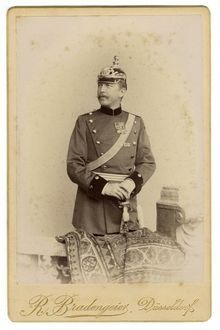 Through family contacts, however, (his mother, Maria Josephine F Storck, was from a family of wealthy industrialists) he obtained a job representing Krupp, the German arms maker. He sold weapons in Chile and other South American countries for a few years. (It has been said that Krupp would sell hardened metal to shield armies then sell even tougher artillery shells to pierce that extra-hard steel, so it could then sell even tougher steel and even stronger artillery.) Later, in about 1896, Schinzinger moved to Japan to represent Krupp. 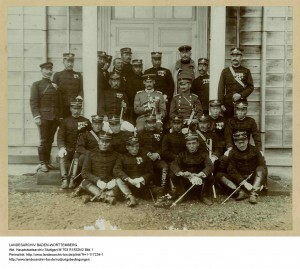 Here’s a picture of Albert with Japanese soldiers, and of Albert as a young officer. In Japan, Albert lived very well. There was an article in Harpers Weekly about a drama among Albert’s servants that was titled “The Courteous Avenger,” in which a samurai who is working for Albert in a lowly servant post, gets impatient with the head houseboy who is of a lower class and cuts his head off with his sword. I posted the article on this site earlier here. My grandfather told the story of how Albert used to entertain people of high society with these elaborate 10-course dinners. To make sure everything was just right, he would have a full-rehearsal for the dinner at which he would have the entire 10-course meal for 12 people cooked so he could test the meals. The leftovers would go to the servants. My grandfather Schinziner, who spent 60 years teaching literature and philosophy at Japanese universities such as Gakushuin and Tokyo University, says he first became enamored of Japan when he visited his Uncle Albert at his home called Villa Sakura, which means Cherry Blossom Castle. 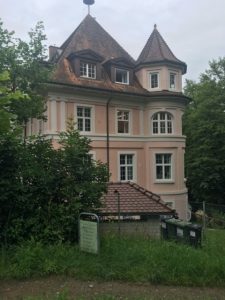 It was the mansion Albert built in Freiburg on his return from Japan. 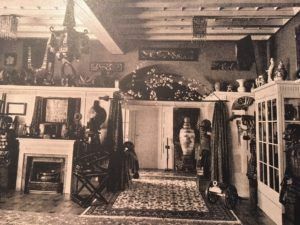 Albert had filled the villa with the Japanese antiques he collected while in Japan from 1898-1906 including ancient samurai armor and bronze canons. It was at that villa that my grandfather, Opa, as a child, saw these mysterious Japanese implements and became curious about the culture that had produce them. It was Albert who, as honorary consul general representing Japan, would later help my grandfather find his first teaching job at Osaka Koto Gakko, an elite high school in Japan. I had learned years ago that this Villa Sakura was still standing and decided to visit. 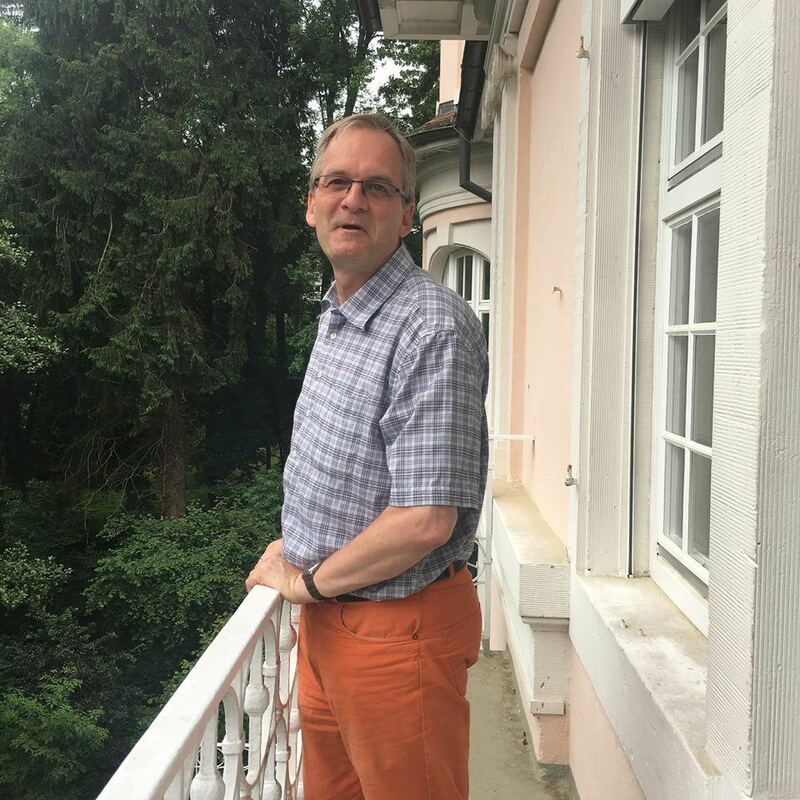 The mansion turned out to be an hour’s walk from where I was staying south of Frieburg. My journey took me through vineyards and rolling hills into a wealthy neighborhood filled with giant homes. Here to the right is Villa Sakura as it looks today. 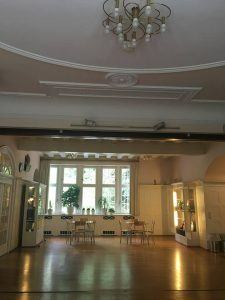 I entered the building and learned that the house had been converted into a school for teachers. 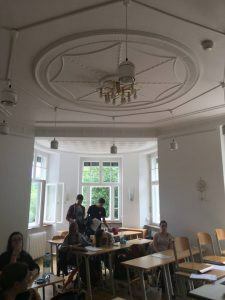 I was quickly introduced to school master Lutz-Walter Muller-Till, a friendly gentleman who gave me a tour through the four-story building’s 35 or so rooms. It was a beautiful house. 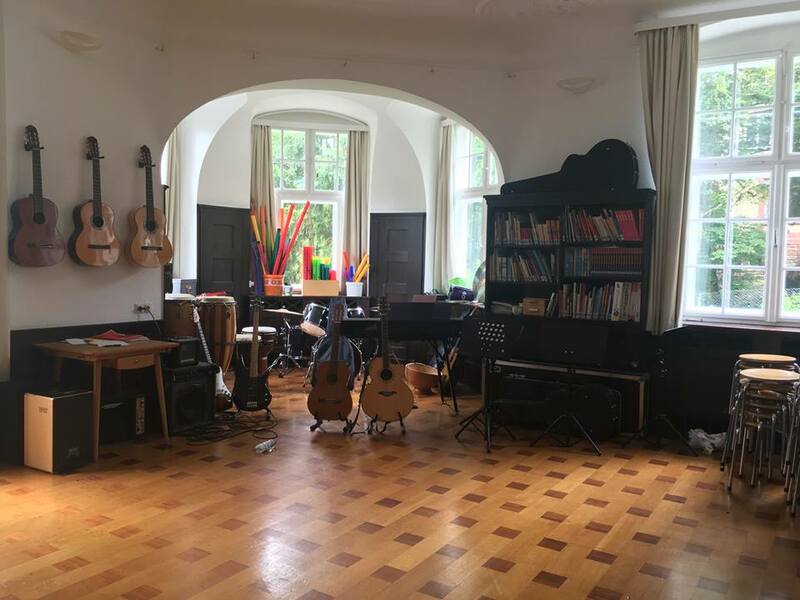 It was disturbing to think the home was built with money earned from selling weapons, but it pleased me to see the school now used for teaching young students how to teach art and music. At the end of the day, when I had access to the Internet over wifi, I looked up Villa Sakura to see if I could find any more information. That’s when I came across some postcards on Ebay that turned out to be photographs of the interior of Villa Sakura from Albert’s day. Whether it was Albert or the person who bought the Villa from Albert who had the photographs taken, I don’t know. 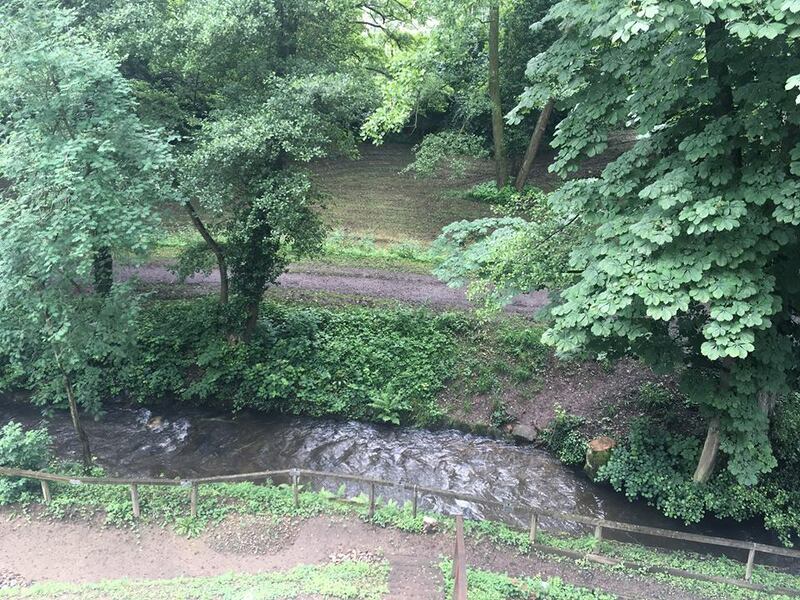 Albert, in an odd form of justice, lost all his money to a swindler who persuaded him there was oil to be found in the Black Forest. In any case, these postcards gave me a sense of what my grandfather must have seen when he visited this home as a child. The picture shows a full suit of army, a bronze canon and lots of Japanese and Chinese ceramics. But then I found another postcard that was particularly exciting because it reminded me of a story my grandfather told. Grandfather said that his Uncle Albert had brought home from Japan a huge statue of the Buddha. But because his Catholic visitors were so offended by the statue, Albert had a bamboo screen placed above the Buddha that he could roll down to hide the statue when he had visitors. Here was a postcard of that Buddha! A little strange that there is a huge sword leaning against the statue, but so wonderful to have photographic evidence to back up one of my grandfather’s stories.